A quiet and serene location awaits your arrival in the gated community of Palmer residences. 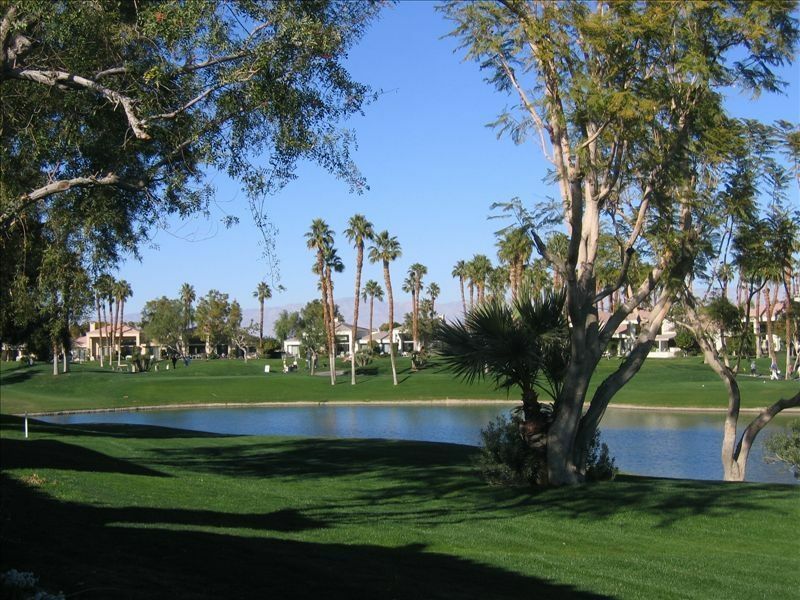 This single story two bedroom, den, two bath home is situated on the 7th fairway of the Palmer course. Facing east from the back patio's with over 1600 sq.ft., this end unit offers privacy and a open feeling of spaciousness. As you enter the premises you will be welcomed by the Tuscan details in furnishings and decor. Upon entering the kitchen, dining area or living room you can see the breathtaking view of the lake and golf course which spans the entire back of the property. Whether you are cooking, dining, or just relaxing and watching TV, the view is right there for your pleasure. The living room is furnished with comfort in mind, a sectional sofa to accomodate several for seating, a entertainmnet center with a 50' screen TV, CD/DVD, Blue Ray player and a wetbar for entertaining. The dining room has seating for six at the table and two bar stools for the counter off the kitchen. The kitchen is fully equiped with everything you will need to entertain, cook, or just prepare a cup of tea from the instant hot water tap with purifier. . . As you enter the hall you have a den for those quiet moments, with two chenille couches and a 32' Flat Screeen TV, with the laundry room across for your convenience. Down the hall is the guest bedroom with a private entry to the bathroom that can also be entered from the hall, designer furnishings, full size mirrored closet doors and a 27' Flat screen TV. Across the hall is the master bedroom with designer window coverings, and bedding, two full size mirrored closet doors, a 30' Flat screen TV, and a private patio for that first cup of coffee or a good read. The master bathroom has two sinks, a roman tub, luxurious towels and a third closet. This home is turnkey to meet your every need and ensure your stay is comfortable. A peaceful and tranquil setting both inside and out,with time passing at a much slower pace. The perfect getaway for relaxing or having fun! Master has tub and shower, 2nd bath shower only. THE GOLF PATH IS ON THE OTHER SIDE OF THE LAKE,SO NO WAYWARD GOLF BALLS TO WORRY ABOUT. CALPHALON COOKWARE CASUAL AND MORE FORMAL DISHES, SERVING PIECES,ETC. INSTANT HOT WATER ON TAP WITH PURIFIER. Each bedroom,living room and den. Three in PGA open to public. This is the second time my husband and I rent this condo. The owners are incredibly nice and welcoming. The condo is pristine and located close to all amenities. It has everything we can possibly need and more. We will definitely continue to rent this place each year. Thank you for being such great guests! We are so pleased you enjoyed your stay. If you're looking for a quiet, convenient, clean and very well-appointed place to stay in La Quinta, this is that place. The owner made the booking process quick and simple and the condo had everything we needed for our stay. We would book it again in a heartbeat. pleasure to accommodate you again! My husband and I recently rented the condo for the whole month of April. We could not have been more satisfied with the cleanliness and comfort it offered. The hostess did a fantastic job of making our stay so comfortable. We are very familiar with La Quinta and all it has to offer. This condo was centrally located and close to everything. We will definitely rent again for next season. Thank you!! Thank you for your lovely review and for considering us in the future! We will look forward to your next stay. It would be our pleasure,so glad that you enjoyed your stay. This is our second time to stay at this condo and we truly love it. It is clean, comfortable and has a wonderful view every morning. It feels like home. Everything you need is there to make your stay enjoyable. Joe and Christine are wonderful hosts. Your close to everything you would like to do but nice and quiet. See ya next year! PALM SPRINGS AERIAL TRAMWAY,CABAZON OUTLET STORES(A SHOPPERS PARADISE)RIVERWALK,OLD TOWNE LA QUINTA AND MUCH MORE.